I am a big fan of Steve McCurry’s work and there is one photo in particular that I love. 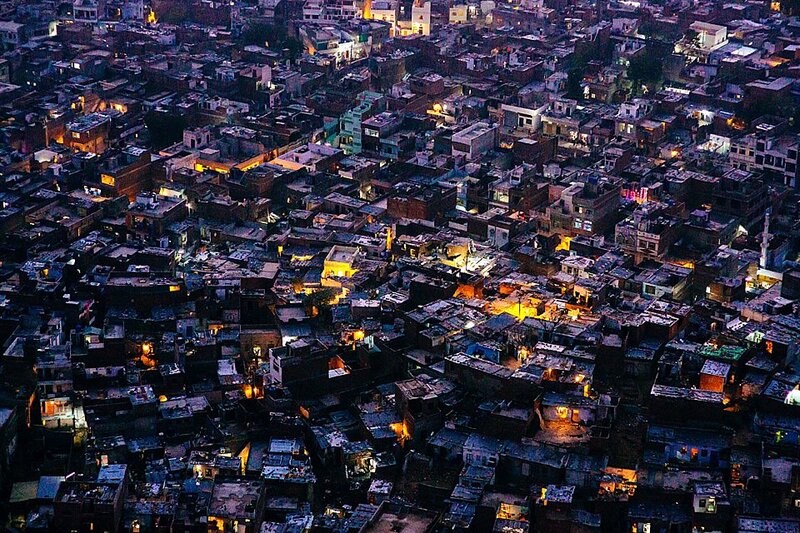 It was taken in Jodhpur (the blue city) and shows the city photographed form a high vantage point during the “blue hour”. After first seeing it I always wanted to produce something like this, print and hang on my wall. I still have not been in Jodhpur, but I was lucky enough to have visited Jaipur (the pink city). When I was planing my trip in India, I had this idea to make a similar photo and started to research if it was possible in Jaipur. 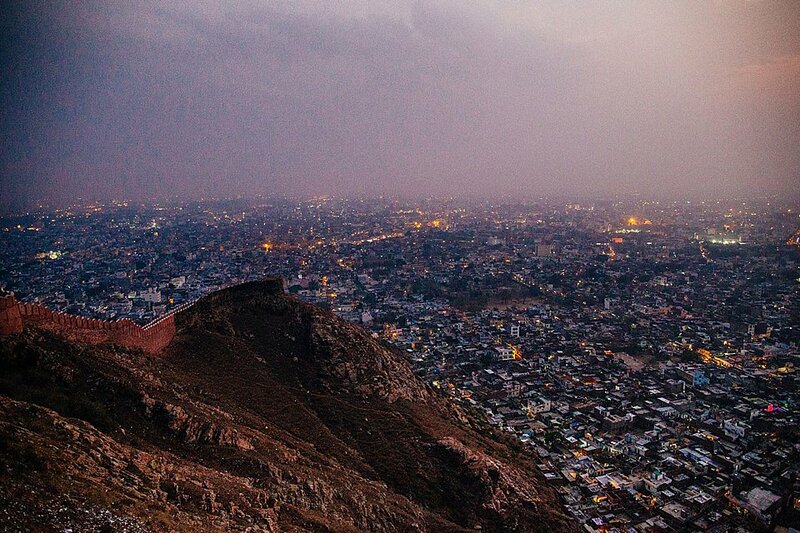 Using Google maps, I found that I can “climb” to Nahargarh Fort in the outskirts of the city and try from there. I entered the fort and walked towards the highest point on the wall. When I climbed I found out that I wasn’t the only one wanting to enjoy the view 🙂 There were a few young couples having fun and drinking sodas. It was already quite dark and definitely not perfect, but I went for the shot anyway. I didn’t have a tripod, so I tried to fix the camera on the wall somehow, in order to use slower shutter speed without blurring the shot. The teenagers around me spoke Hindi, which I don’t understand, but I can bet their ware laughing on my expense observing me setting up my gear 🙂 It didn’t work out, I couldn’t get the composition I wanted, so I decided to use a different approach. I cranked up my Iso and did a few handheld shots. The photos turned out quite noisy as you can see, but still usable. Here is one more photo from the same spot on the wall. The resulting photo is nowhere near as good as Steve McCurry’s image, but I still love it. Moral of the story: Always be prepared to improvise. There is no right or wrong way to achieve a specific result. This entry was posted in Behind the photo and tagged Behind the photo, Jaipur, Photo retreats in India, The Pink City on February 21, 2017 by .